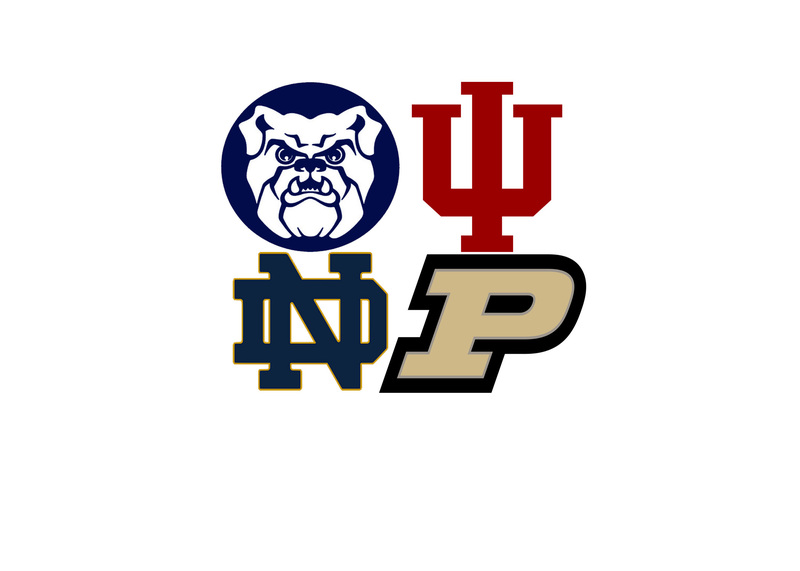 The logos of the four teams competing in the Crossroads Classic on Dec. 17. Logos via Wikimedia Commons. “Welcome to Indiana basketball,” head coach Norman Dale said as he opened the door to a packed gymnasium to coach the Hickory Huskers for the first time. This passion for basketball in Indiana shows itself at the high school level as well as the college level. On Dec. 17, Indiana’s four premier college basketball programs, the Butler Bulldogs, Indiana Hoosiers, Notre Dame Fighting Irish and Purdue Boilermakers, will meet in Bankers Life Fieldhouse for the sixth installation of the Crossroads Classic. Notre Dame’s head coach Mike Brey raised eyebrows after praising his program a few days before last year’s Crossroads Classic. “We’re the most consistent program in this state, and it isn’t even close,” Brey told reporters during a press conference before Notre Dame’s matchup against Indiana last year. This comment left many basketball fans in the state of Indiana to wonder about what historical numbers Brey was referencing to make such a confident statement. As the spectacle in Bankers Life Fieldhouse creeps closer, it’s time to rank the four programs based on recent history. In order to do this, everything since the 2000-01 season will be considered. When trying to decide which program is better than the rest, a number of different categories must be examined. In college basketball, a program’s success is defined by the month of March, so the analysis has to begin there. Forget about winning the National Championship or advancing to the Final Four for a moment because in order to obtain those goals, a team must first qualify for March Madness. Since the 2000-01 season, Notre Dame has appeared in the NCAA Tournament 11 times, Butler and Indiana 10 times each and Purdue nine times. The differences here are quite small, so I think it is fair to say each of the four teams register similarly in this category. The differences become pronounced when one compares how many NCAA Tournament games each team has won during the aforementioned appearances. The Bulldogs lead this category decisively with 19 wins. The Hoosiers won 14 games, the Fighting Irish have 12 and the Boilermakers finished in last place with nine. While it’s crucial to win games in March, it is even more important to string wins together in order to advance in the tournament. If a team can win four consecutive games, assuming they don’t play in the First Four round, they punch a ticket to the Final Four and have won a regional championship trophy in the process. Leading this category again is Butler, who has appeared in two Final Fours since 2000-01. Indiana played in one, while Notre Dame and Purdue both failed to reach this semifinal stage. None of the four teams have won a National Championship since 2000-01. The most recent champion was the 1986-87 Indiana Hoosiers team coached by Bob Knight. Aside from the postseason, basketball fans recognize regular season conference championships as a signal of a team’s dominance compared to schools of similar qualities. Butler won their previous conference, the Horizon League, eight times. Indiana was the best regular season Big Ten team three times while Purdue won the Big Ten once and Notre Dame failed to win a regular season conference championship in this stretch. The next category looks at how successful a team is at producing NBA players. While this statistic may not seem as prevalent for fans, many recruits value a school they know will take them to the next level. Since 2000-01, Indiana leads the way, sending eight players to the NBA during this time. Notre Dame and Purdue had six and five players play at the professional level respectively while Butler sent just two. How well each team has performed in the Crossroads Classic since its inception in 2011 is also a key metric. The Bulldogs hold a 4-1 record in the yearly event while the Hoosiers and Fighting Irish each have a 3-2 mark. The Boilermakers have never won, so they hold a 0-5 record. However, Butler doesn’t play Notre Dame in this event, and Indiana doesn’t play Purdue, so these records alone don’t paint a clear head to head picture. After reviewing all of the above evidence, I believe the Purdue Boilermakers are the clear choice for being the worst of the four programs since 2000-01. In almost every category, they finished in last place, and their performance in March hurts their ranking. The Notre Dame Fighting Irish check in at third place. While they’ve managed to advance to the Elite Eight twice in recent memory, the Final Four eluded them each time. Also, the fact the team hasn’t won a regular season conference championship in the selected time frame lands them at third in the rankings. In second place is the Indiana Hoosiers. This historic program hasn’t been nearly as productive since 2000-01 as they would have liked to been. With that being said, they were one of the two teams to reach a Final Four. Also, their rate of sending players to the NBA and three Big Ten regular season championships vaulted them to the number two slot. Since 2000-01, the Butler Bulldogs have been the best college basketball team in Indiana. The reasoning is simple; they thrived in March. With 19 NCAA Tournament wins and two Final Fours, which led to two National Championship game appearances, the Bulldogs are the clear number one choice. Their 4-1 record at the Crossroads Classic is icing on the cake. Now that the debate is settled, throw out all the numbers and enjoy the electricity pulsing through Bankers Life Fieldhouse on Dec. 17 as bragging rights are won and lost.